IBM reported its third quarter financials this past week that showed a company struggling with its legacy hardware business and the problems that come with a confused cloud services strategy. Revenues were down $1 billion with hardware sales declining 17 percent. Overall revenues for the nine-month period totaled $72.1 billion, a decrease of 4 percent, compared with $75.2 billion for the nine months of 2012. The software division is not having tremendous success, either. This last quarter software sales were up just one percent. IBM has troubles — its stock is at a two-year low and the company has made some big promises for the years ahead. It has stated it would make $7 billion in annual cloud revenues by 2015 and in the same year will give shareholders a return of $20 earnings per share. In the meantime, the SEC is investigating how IBM is counting its revenues for how it recognizes cloud computing. IBM has for the past five years talked about the “private cloud” and how corporate data centers can consolidate their investments. These big machines for the most part house vertical software stacks, on-premise software. It’s a brittle argument that these are multi-tenant systems, elastic in nature and provide a way for customers to get the benefits that come with cloud services. The reality: these systems have to be purchased, installed in a data center, loaded with software and then maintained by an IT team. To reiterate, customers do have a need for this infrastructure but it is more a retooling of the data center more than anything else. IBM’s fundamental problem: they supply those being disrupted by technology, not those doing the disrupting. Today an IBM dependency can be an existential risk. On a distributed infrastructure a customer can run cloud services by themselves and use it as a foundation for running their business. Often, they don’t need any IT support whatsoever. I can’t think of a way to easily do that with IBM technology. I’d have to buy my own machines or go through some hosted service and then pay for the software. And I’d need an IT team. It costs less to run cloud services for all except the larget of companies. Customers will often pay on a monthly basis. The investment in infrastructure is paid by the provider, a company AWS. This is nothing necessarily that new but the rate of change is happening fast. Startups and developers use services like AWS for building new services. That can’t be also said about IBM, which has for years attracted IT far more than developers. This new generation of infrastructure providers don’t necessarily control the market but their rate of innovation does provide a distinct advantage. The new infrastructure technologies are catering to the need for greater portability portability portability faser development so applications can run anywhere. It’s a model that serves customers who want on-demand self-services. IBM is a leader in one respect. 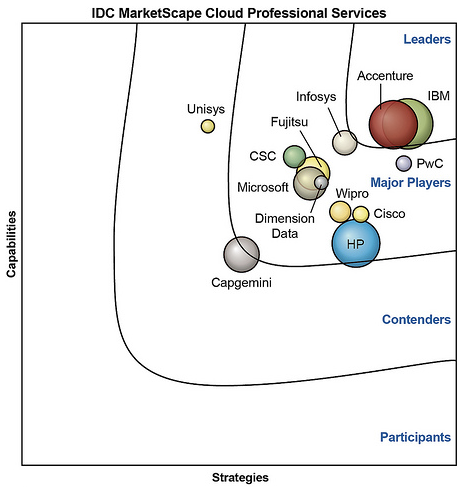 IDC says the company is number one in offering professional services to integrate cloud solutions. An IBM spokesperson excitedly wrote in an mail to me that AWS is not even in the IDC rankings! Well, of course they are not. AWS does everything it can NOT to provide professional services. That’s the point of offering on-demand, self-service technologies. AWS can let the customer’s consultants do the integration work. 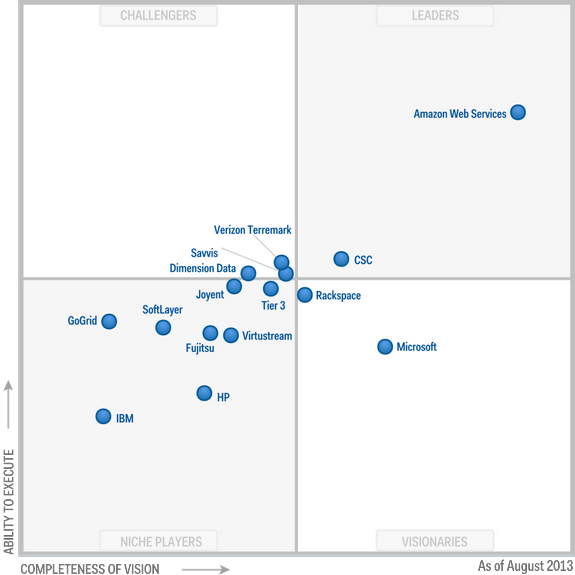 Now, contrast the IDC cloud consulting study to Gartner’s magic quadrant and AWS is the dominant leader while IBM is at the other end of the spectrum. IBM should fare better on this chart next year. This summer, the company acquired SoftLayer for $2 billion which it will integrate with the IBM Smart Cloud offering. SoftLayer is already helping deliver for IBM. IBM reported $460 million in cloud services for the third quarter. It’s unclear what amount of revenues came from SoftLayer but it undoubtedly represents a chunk. Big Blue will let SoftLayer run pretty much on its own for the next year, which is a good thing, said Michael Coté , a research director for 451 Research. He said SoftLayer appeals to organizations that use its specially designed servers for different workloads. SoftLayer offers servers that just run Hadoop or VMware and a variety of other workloads. But the question is more about how IBM manages this new service over the long run.